ARVEL BIRD is a classically trained as a violinist compositions whose performances encompass traditional Celtic tunes and bluegrass standards to his contemporary Native American and Celtic rock orchestrations. His performances have been called “Braveheart Meets Last of the Mohicans … at Woodstock.” Arvel toured worldwide with Glen Campbell for six years and also worked with Loretta Lynn, Tom T. Hall, Ray Price, Louise Mandrell, and Clay Walker. CICADA RHYTHM is the sound of Juilliard-trained bassist Andrea DeMarcus and rootsy guitarist Dave Kirslis. Born and raised in Georgia, the duo merges both traditional and contemporary Americana music with topical lyrics. 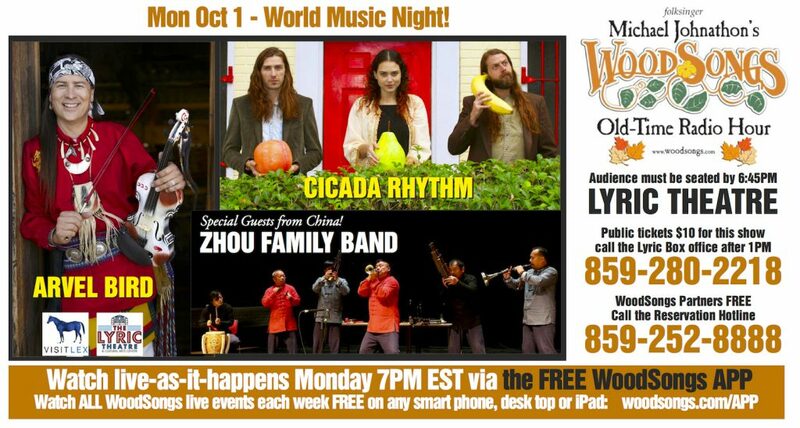 Special Guests: ZHOU FAMILY BAND ( 周 家 班 ) plays traditional wind and percussion music which accompany birth and death celebrations of the people of Central-Eastern China for more than 600 years. Coming from Lingbi, Anhui Province, part of the Central Plain area which formed the cradle of Chinese civilization, the Zhou family have been musicians for seven generations, and are bearers of a tradition that represents the finest of Chinese folk music.